Samsung updates - Does Samsung update its Android devices? - PC Buyer Beware! Home » Samsung updates – Does Samsung update its Android devices? Samsung updates – Does Samsung update its Android devices? Samsung updates – Does Samsung update all of its Android phones and tablets to the latest version? The installation of Samsung updates of phones and tablets running on Google’s Android operating system is a hit-and-miss affair. It is simply impossible for Google to release a new version of Android that works on hundreds of different Android devices. It is the device manufacturers that have to update the device drivers for older models to work with a newer version of Android. Bear in mind that since 2007, only six generations of the Apple iPhone compared to over 800 Android models made by many manufacturers have been released. It is true that Apple updates older iPhones and iPads with the latest version of its iOS mobile operating system. However, many or all of the latest features won’t appear on the older models, especially the iPhone models. Smartphones that run Windows use the Windows Phone versions of Windows 7/8.1/10. With regard to Windows phones, there are several YouTube videos showing how to upgrade a Windows Phone 8.1 phone to Windows Phone 10. Unfortunately, Windows Phone 7 phones will never receive an update to Windows Phone 8.1 and therefore also not to Windows Phone 10. Moreover, it appears as if Microsoft does not provide security updates for Windows Phone 7. Indeed, the subject of Windows Phone security updates for any version receives next to no attention on the web, even from Microsoft itself. There is nothing in that article on whether or not Microsoft provides security updates for Windows Phone 8.1 as it does for Windows 7/8.1/10 for desktop and laptop PCs. It just says that Microsoft has locked down that mobile operating system very well. That you can’t go wrong as long as you only download apps from the Microsoft Store and don’t open emails from unknown sources that might install malware. Since smartphones are used in public places, security is of the utmost importance. If you were using a laptop in a restaurant using its Wi-Fi, it would be much less secure than if you were using it at home. Since smartphones are much less secure than PCs, I would never use an Android phone for banking and shopping. Not even the latest models using the latest version of Android. It is not generally known that Google Android devices are not monitored effectively by anti-virus and malware apps. Pushed with no choice, I would use any model of iPhone or a model using Windows Phone 10 to access banking and shopping sites. As far as I am concerned, online banking and shopping is something I do at home on a computer. Note that using a wired Ethernet connection to a modem router is more secure than using a Wi-Fi connection. The latest version of Android at the time of writing this is Nougat. The phone manufacturers have a very variable history of updating to the latest version. The following article gives a percentage score to the major phone manufacturers on how they deliver updates. If you have a new Samsung phone or tablet and a new version of Android becomes available, depending on who updates the phone – Samsung or your service provider – your device might receive the update or it might not. However, if you have an old phone/tablet that is a few years old, it most probably won’t receive the latest version of Android. This is because the phone manufacturers of Android phones and the phone service providers, including Samsung, have little or no interest in updating them. Their concern lies with their latest models. They want you to buy them instead of hanging on to an old model. Unfortunately, the situation is the same with regard to tablets. Your Android phone provides which version it is using. The following Wikipedia page provides a list of the versions of Android under Platform usage. At the time of writing, the latest version was Nougat, release date October 4, 2016. Google’s Nexus smartphones and tablets receive Android updates directly from Google, avoiding any delays caused by phone service providers that other Android phones can experience. That said, I do not use anything from Google because everything you do with a Google device, software or service, provides Google with information about you that it uses to create a personal profile. Then Google uses what it knows about you to deliver adverts that fall within your interest zone across your path on websites that run its adverts. Facebook uses what it knows about you in the same way. However, Facebook does not provide anything other than what runs from its website. Apparently, there are security concerns about President Trump, just into the first month of his job. He might be accessing Twitter using an old Android-based Samsung Galaxy S4 model dating back to 2013. It is not likely that this model receives Samsung updates that would make it run the latest version of Android called Nougat. This would mean that the phone is probably still using the Jelly Bean or KitKat versions dating back to 2013. 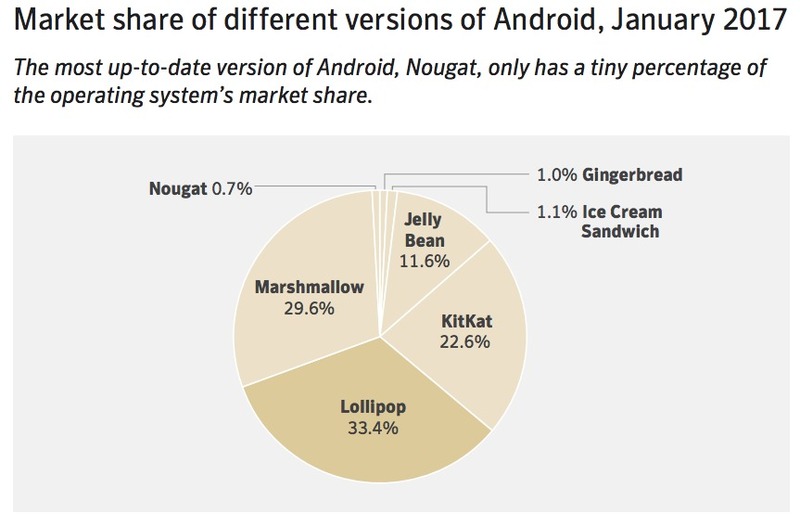 Note that versions of Android have the names of candy. Trump’s generation tend to hang on to their possessions as long as possible, because, for most of their lives, change took place relatively slowly compared to today’s very rapid pace of change. If he is using an old Android phone, then he is going against the advice of his security experts and the advice of the best security companies. They know that the strength of a security system is only as strong as its weakest link. In Trump’s case, if he is using an old Samsung Galaxy S4, the weakest link is that phone. August 8, 2017 in PC Problems and Solutions, Software Problems.